Will Consumers Abandon Your Brand After A Food Scare? Consumers say that a food recall doesn’t have to mean the end of a brand. More than half (54%) want to hear the food producer’s side of a story. A recent survey also shows that 1 in 4 is willing to buy the product as soon as it’s available again. A new white paper, “Allies in Unexpected Places – How Trust in the Media Can Help Your Food Brand,” from SHS FoodThink explains how consumers react and behave when the media reports news of a food scare and what food marketers can do to protect themselves and their consumers. 67% still want the media to break stories about how food is produced. 45% think the media is more trustworthy than food manufacturers and restaurants. 54% of Americans share interesting food production stories with friends and family. 66% of consumers say they will return to a brand after a food scare, once they feel comfortable and enough time has passed. The white paper also covers various topics like memorable food stories from 2015 according to consumers, as well as why some stories were better remembered than others. FoodThink white papers are built on proprietary research conducted in 2014 and utilize the responses from more than 2,000 U.S. consumers of diverse demographic backgrounds. 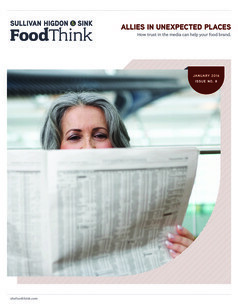 Download a free copy of the white paper with key implications for food marketers, and follow the blog at shsfoodthink.com.